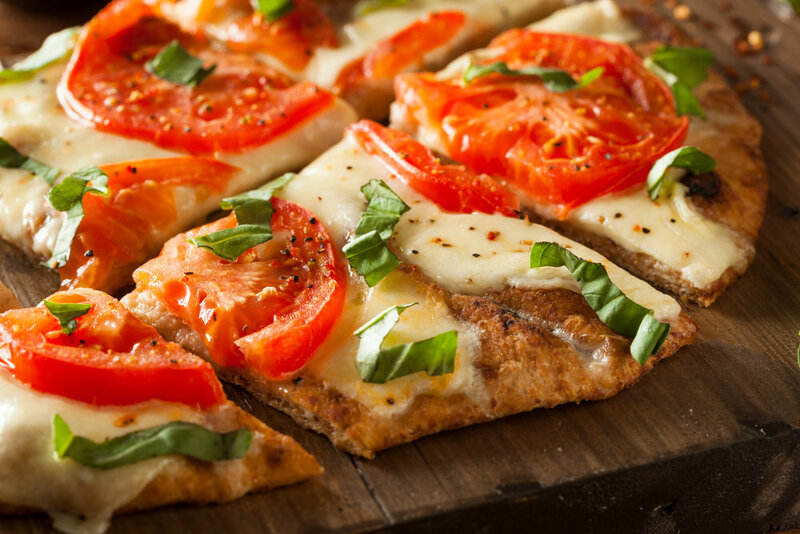 While crust is baking, lay tomatoes on paper towels to blot excess moisture. When crust is ready, sprinkle with spinach, top with tomato slices, and bake 20-25 minutes or until the tomato is cooked. Sprinkle with the basil, drizzle with olive oil, and sprinkle with cheese. Cut pizza into 10 slices. Serve 3 slices per person for dinner, along with 1 1/2 cups of arugula, 2 tablespoons onion, 1 tablespoon pine nuts, and a quarter of the dressing per serving. Package up remaining pizza and salad for lunch tomorrow.